put in the oven at 325. Mild Dextering does not always make a working vent. If the knife is really hard to pull back out, you have a good vent. The cute round one was cut in half vertically and cleaned out. 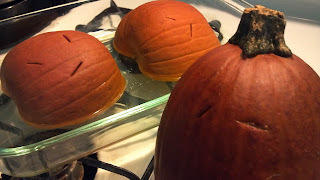 Then it went cut-side down in a 9x13 glass baking dish and put into the same oven as the tall pumpkin. By the time I finished cutting and cleaning #2, the tall pumpkin was really cooking! They were done in 30 minutes. Usually it takes longer, but we were having a good gourd day. I found some finished luffas under Mount Luffa that morning! I can't explain why it didn't take long, just didn't. 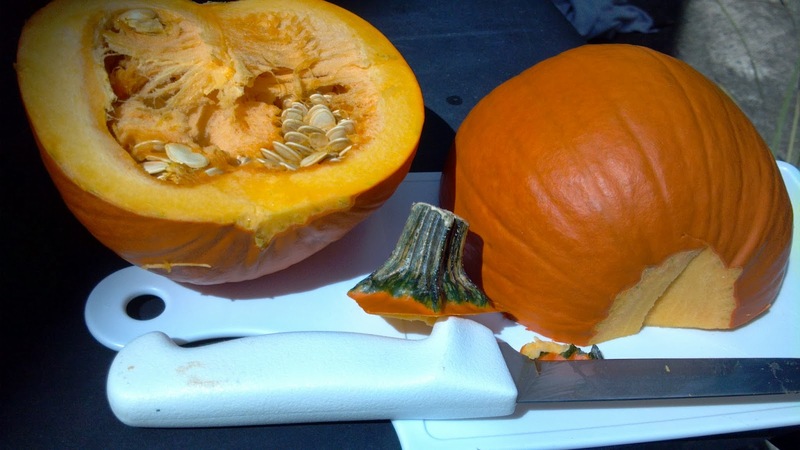 The amount of time it takes to cook a pumpkin varies depending on the size and thickness. Set the timer for half an hour, then 15-20 minute increments after that. Every time it goes off, open the oven and jab the pumpkins with a knife. When they are soft and easy to jab they are finished. 1. Buy the pumpkins and contemplate cooking them. 2. Cook them, cool them and put them in the fridge. 3. 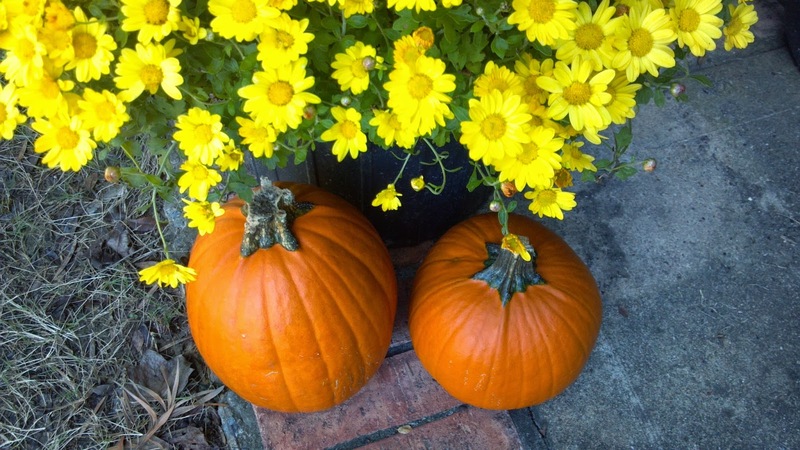 Scoop out the punkin mush and freeze in 1 cup servings. That is the amount most recipes use. 4. Make something tasty. We'll get to that soon. Our favorites are pumpkin pancakes and pumpkin cookies. In the end, they looked yummy. 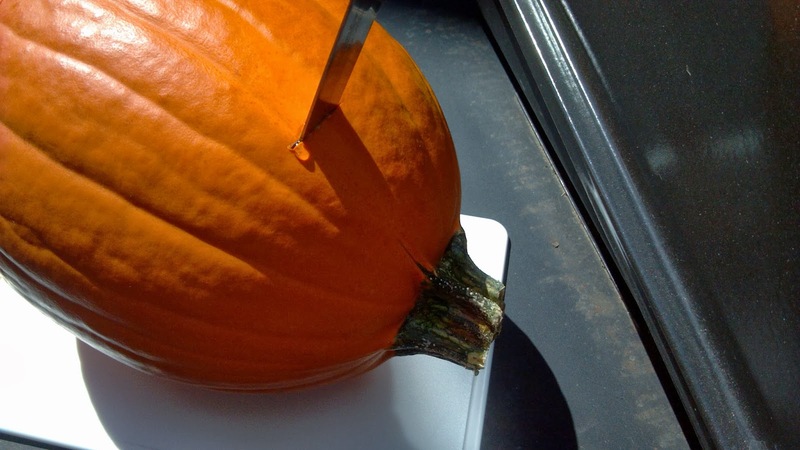 The Whole Pumpkin was not quite as soft when finished. 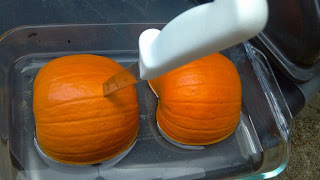 It was much easier to cut in half. I had to scrape out the seeds and strings with a sharp knife. 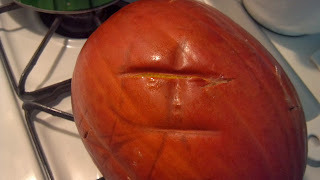 Mom's Baking Dish Method: Cutting a raw pumpkin in half is hard and potentially dangerous. Cleaning was with a spoon, not any easier or harder than cleaning after cooking. The pumpkin was done sooner and the meat was softer and less stringy. We have become pumpkin aficionados and in our many pumpkin adventures sometimes soft pumpkin is best and sometimes firmer pumpkin works better. Either works well so however your pumpkin turns out, it's perfect!